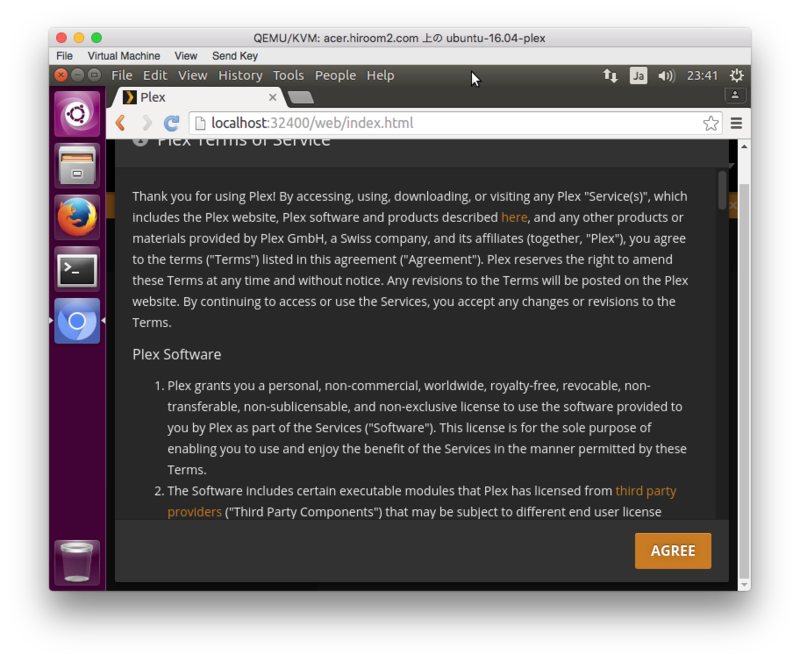 This article will describe installing PLEX and run media server for private net work without PLEX registration. 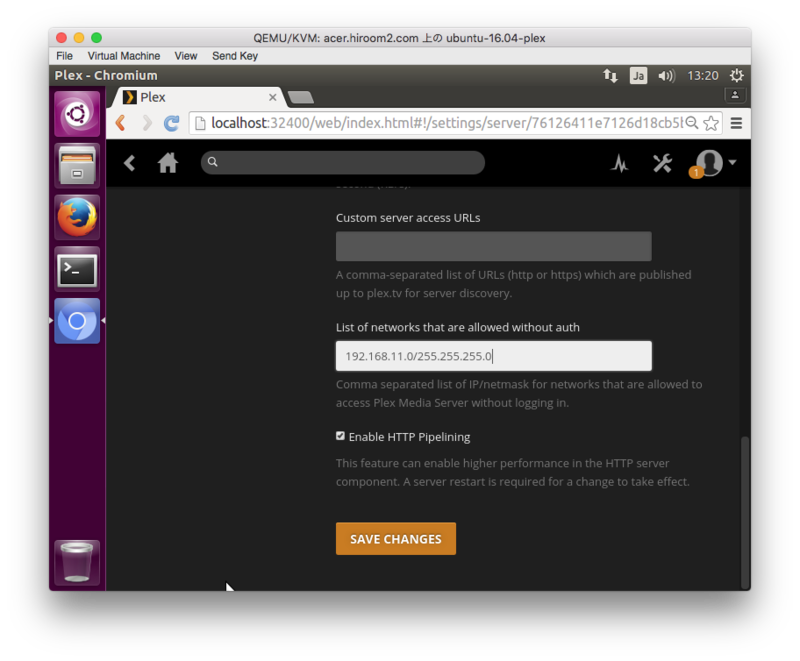 IP address of Ubuntu 16.04 is 192.168.11.86. Download latest PLEX from project page. 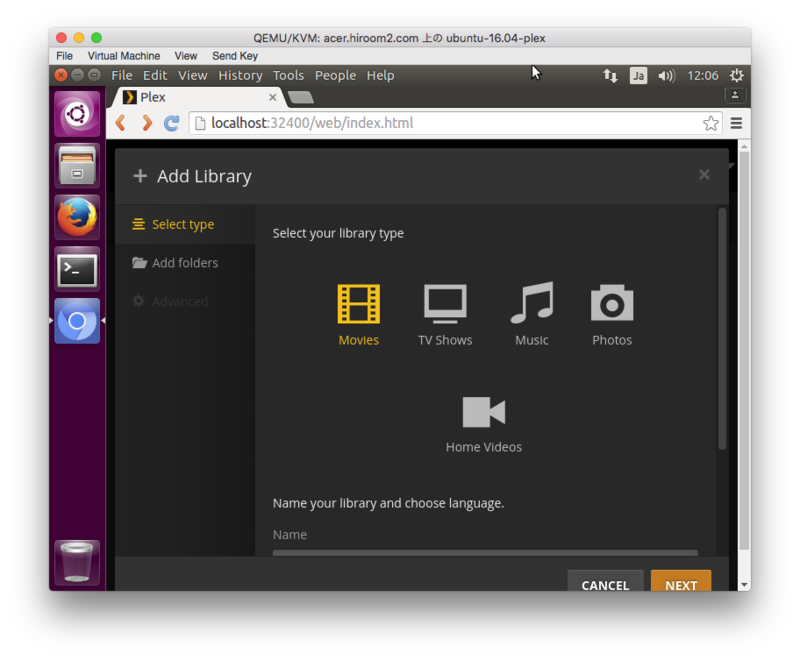 A systemd is set and plex user is added when installing PLEX. 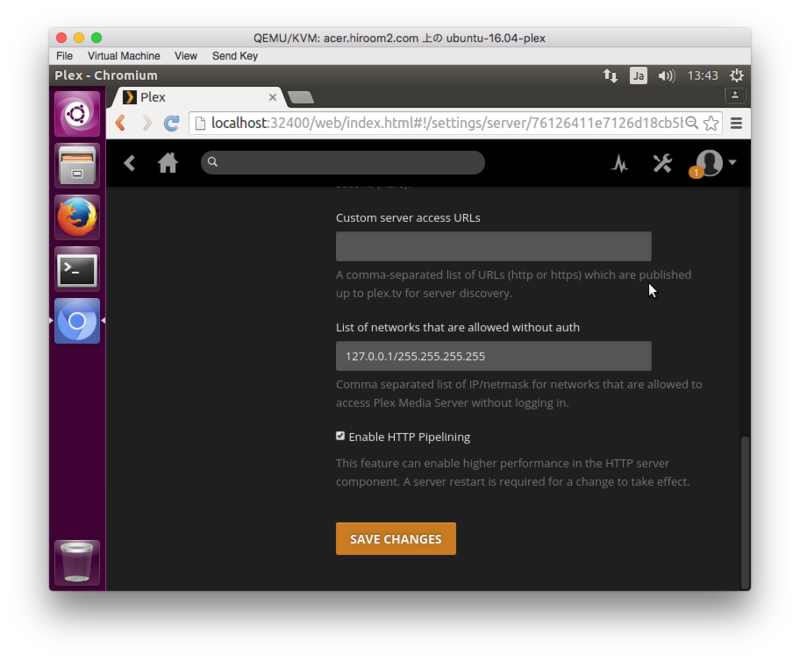 If you use ufw, open 32400/tcp and 32400/udp. Firefox cannot play movie of PLEX. Please install Chrome or Chromium. Access to below URL with Chromium or Chrome. License agreement is dislayed. Press "Agree". PLEX manages movies and pictures with Library. Library will scan all file recursively from the specified directory and create metadata like thumbnail. And then movie and picture is available. The metadata is at below direcotry. Movie library will scan only movie data and Picture library will scan only picture data. 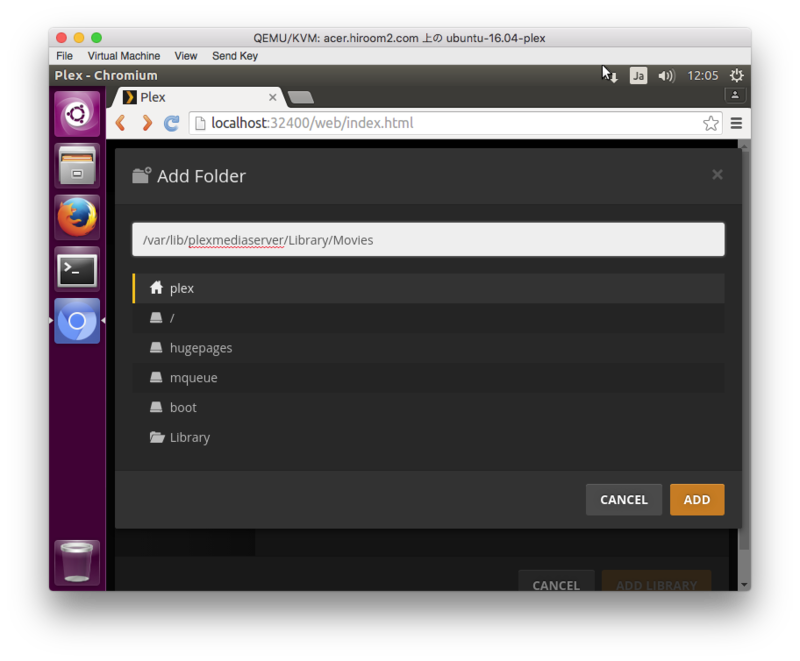 This article will use Movie library specified with below directory. Press "Add Library" at the left side and choose. Select library type and press "NEXT". 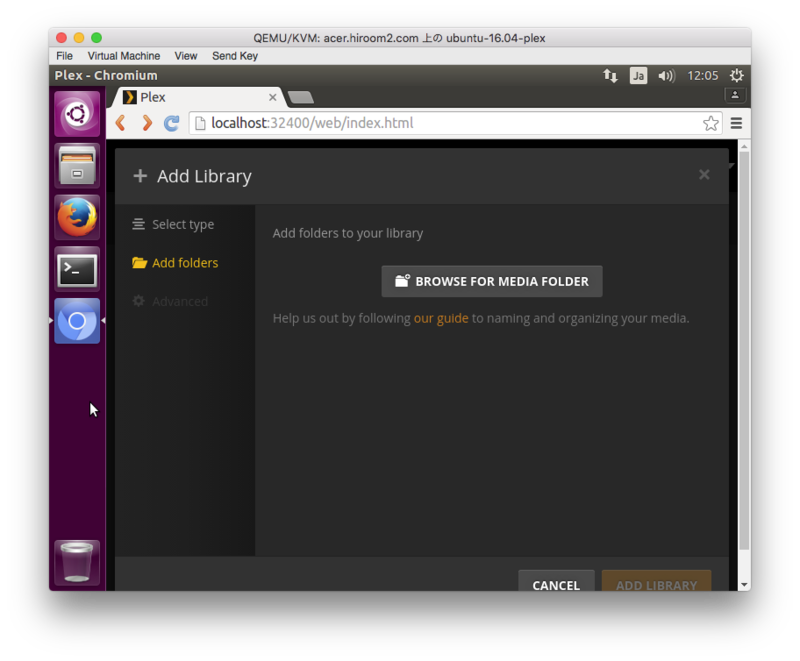 Press "BROWSE FOR MEDIA FOLDER". You can specify multiple directory. Press "ADD" and "ADD LIBRARY". You should create directory if the directory is not exists. 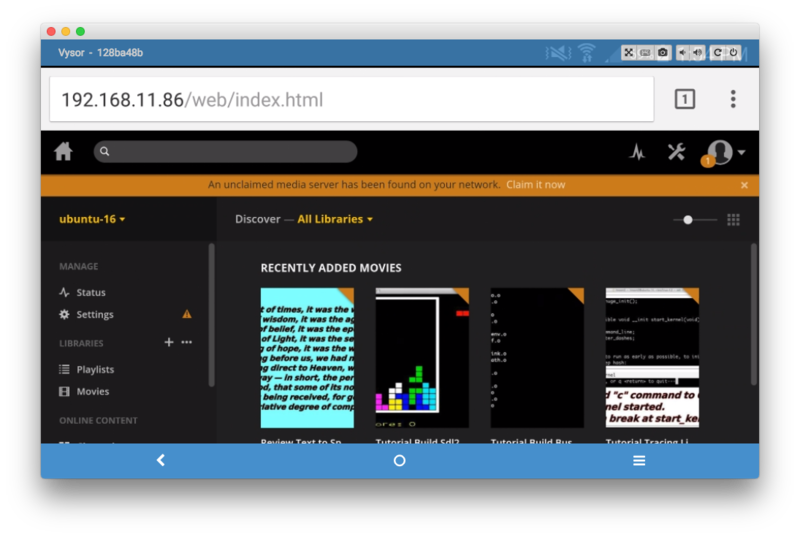 The directory must be readable by PLEX. There is no way of uploading movie and picture by browser. You need to move movie and picture to direcotry. This article will run mv command. MyYoutube is a directory which includes multiple movies. Scan will not be started automatically by default. You can start to scan manually by pressing "Update Library". Deck shows thumbnails of movies after scanning. Movie will be started by clicking a thumbnail. PLEX can control access list with IP address. Press "Setting". 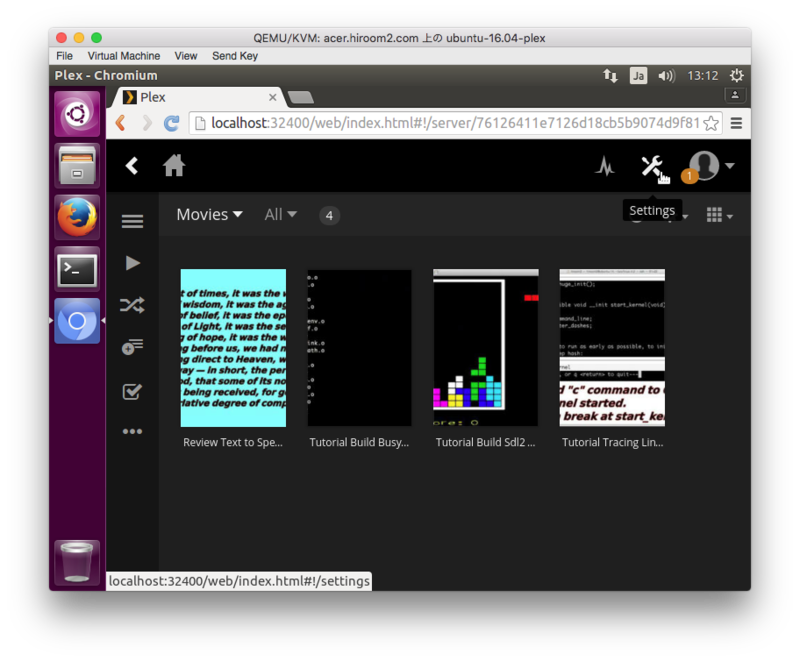 Press "Server" at the upper right. Press "Network" and "SHOW ADVANCED". Add access list to "List of networks that are allowed without auth". This article will add private network "192.168.11.0/255.255.255.0". Press "SAVE CHANGES" and setting will be updated. If you use apache2 digest authentication, please add "127.0.0.1/255.255.255.255". Scan is not started automatically by default. 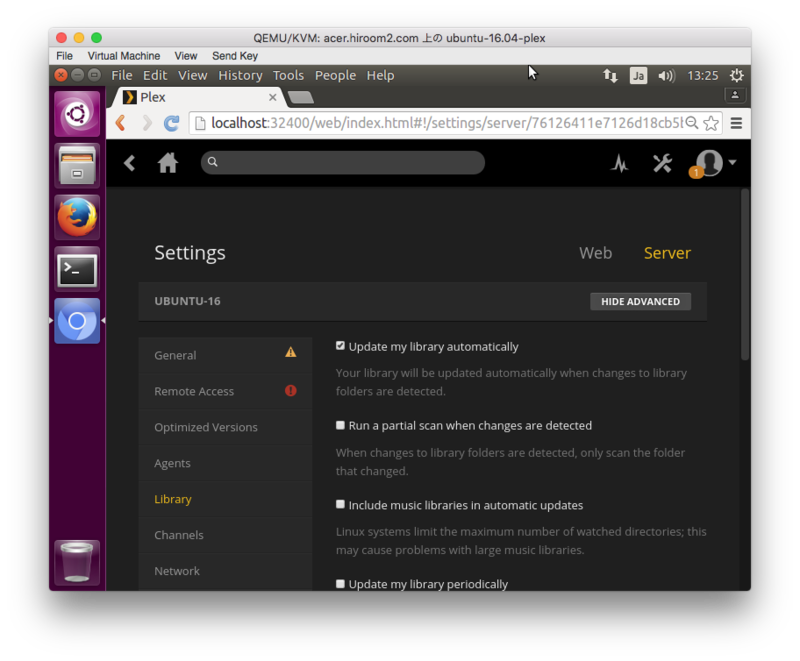 This article will change to be started automatically when the directory of library detectes changes. Check "Update my library automatically". 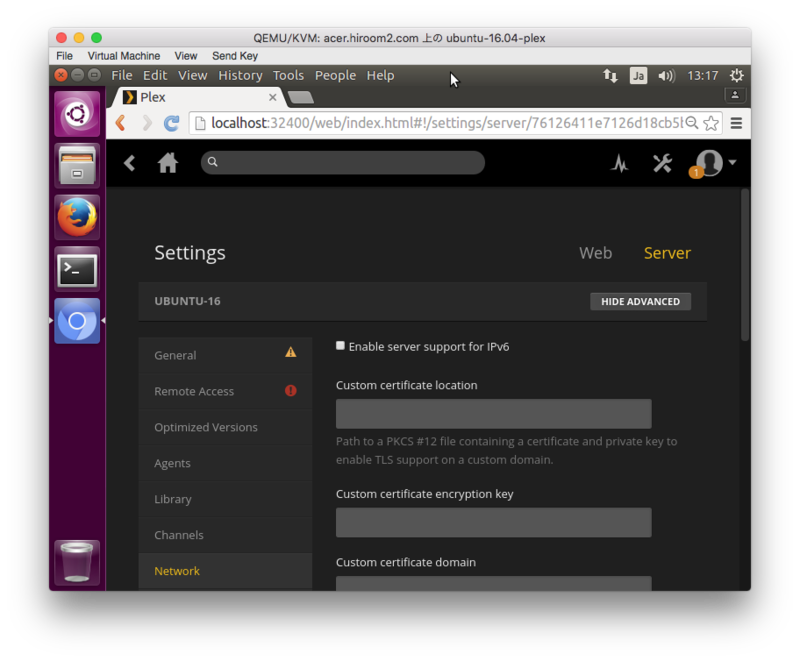 PLEX does not have an authentication for private network. This article will use apache2 proxy_http module and enable authentication for private network with auth_digest module. There is a room for changing URL like www.my.server to www.my.server/plexmediaserver. 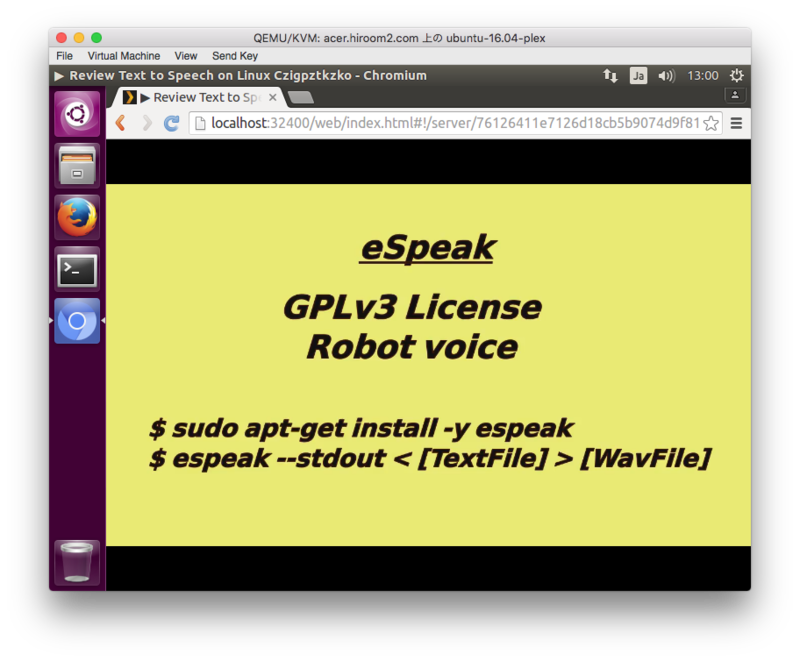 Install apache2 with apt and enable modules with a2enmod. 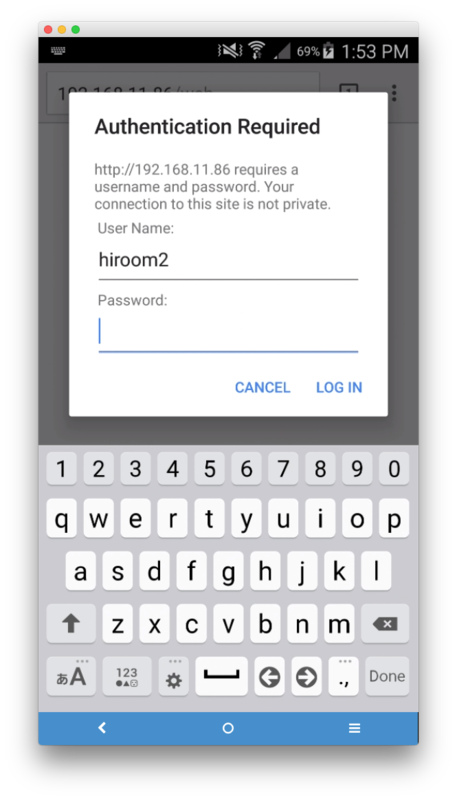 Create password file which has a realm "plexmediaplayer" realm and a user "hiroom2". This user will be used when accessing to URL. Adding password for plexmediaserver in realm hoge. Create site configuration for PLEX according to this site. You can still access with :32400. Please change "List of networks that are allowed without auth" to "127.0.0.1/255.255.255.255". Username and password are required when access to URL without :32400 on Chrome of Android. Accessing to PLEX is completed.